Hello weekend party people! I am back from my Toronto trip! And I think the difference in time zones and a hectic schedule are just hitting me now. All at once. So it comes with PERFECT timing that I am currently enjoying yet another short getaway near where my son is going to camp over the weekend. 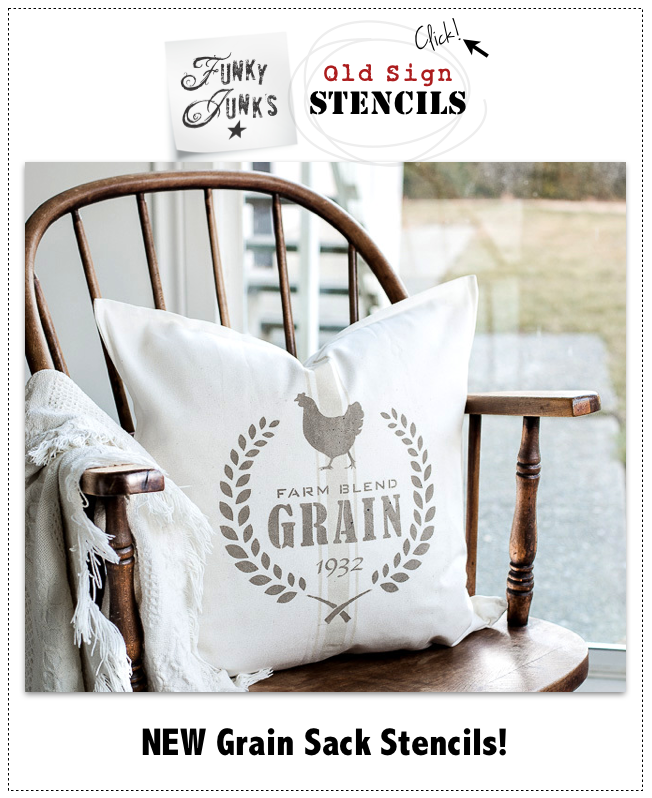 So stay tuned for some new junkin’ adventures ahead. 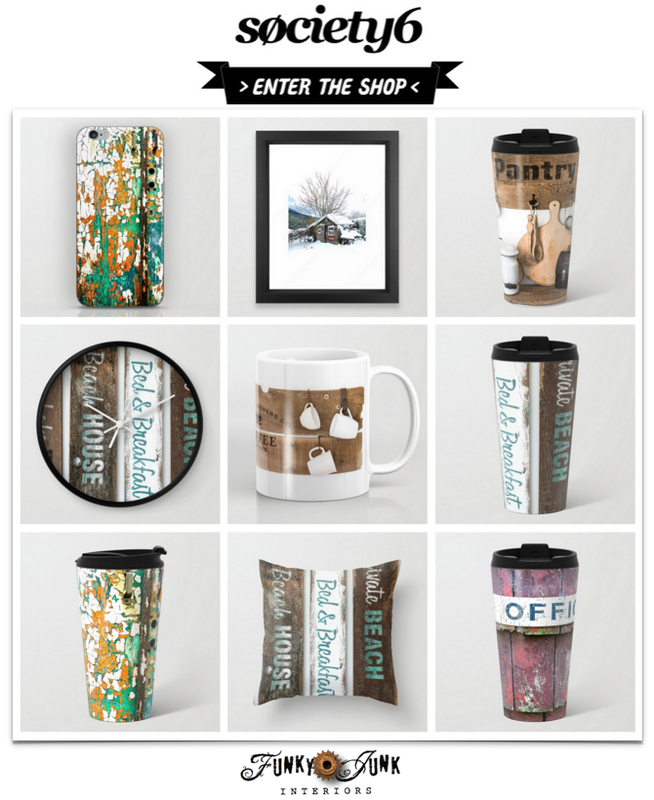 And to hear all about my little cabin in the woods kinda stay…. Joan LOVES directional signs. So she came up with a super cool way to cherish the travels her own family has taken. 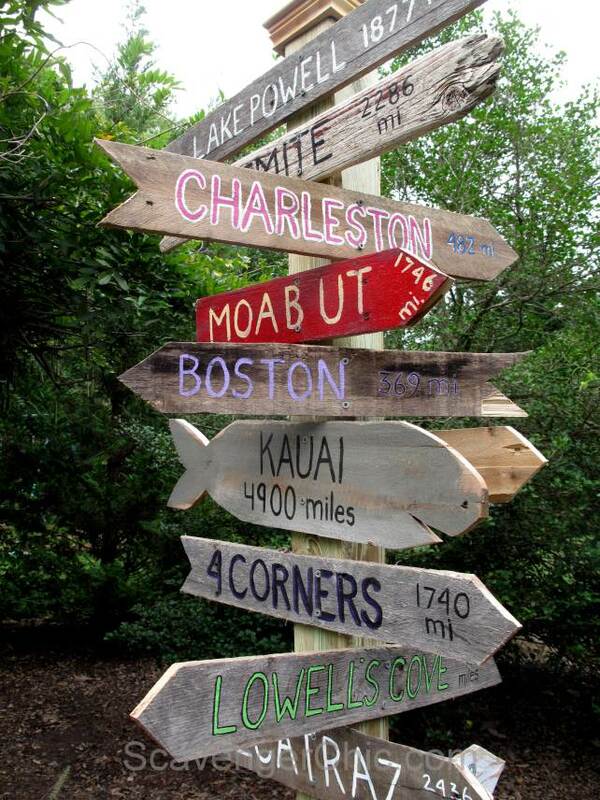 A directional sign, complete with arrows and even a fish… how I love this idea! 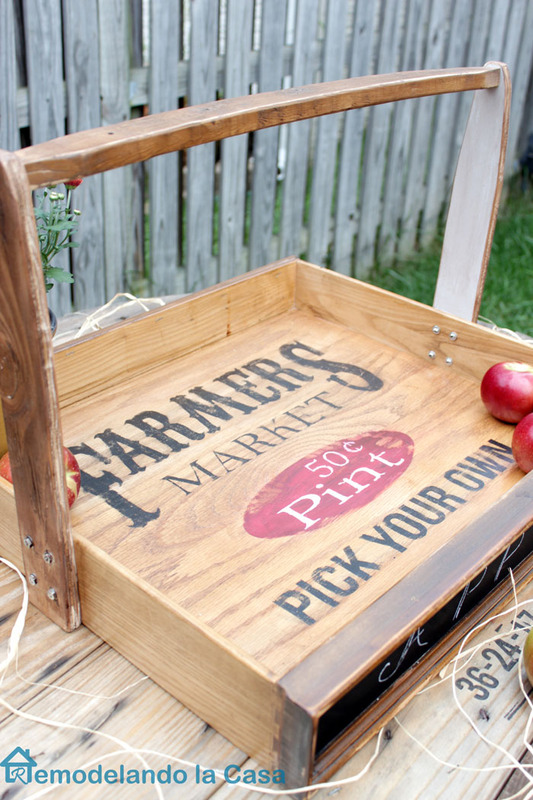 Lucky for US you found your pallet wood, Joan… and I might have to borrow this idea for my own yard. Too cool. I hereby announce that I think all trays ought to have this cool carrying handle… fabulous idea. Becky came up with the perfect idea with some driftwood she had on hand. 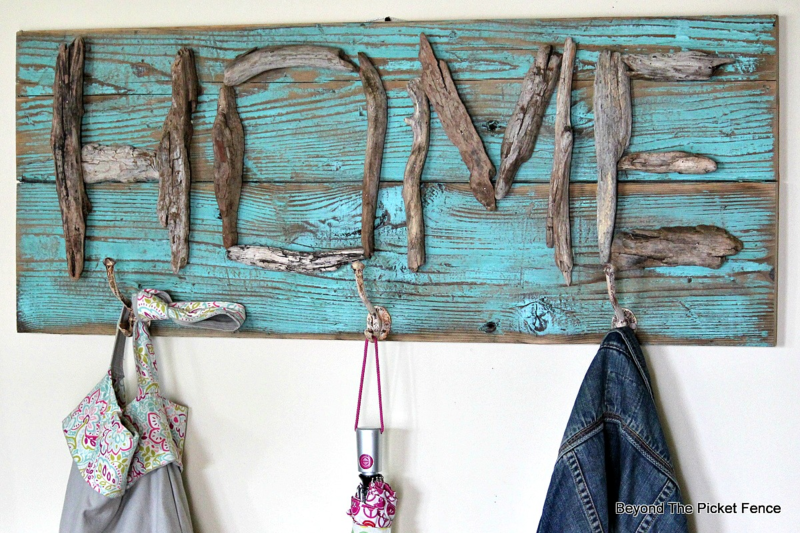 She even shares how she further rusted the iron hooks. This is a lovely, LOVELY project with a little story on what inspired this message. 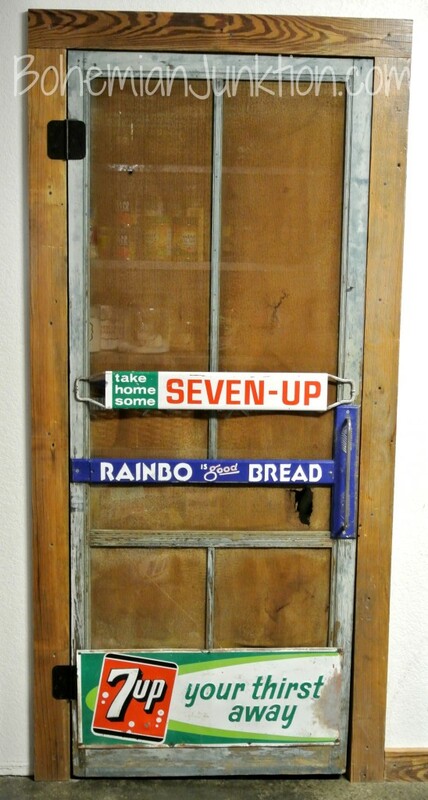 Shannon waited 8 (EIGHT) years to find the perfect pantry door. And I do believe she nailed it in my book! 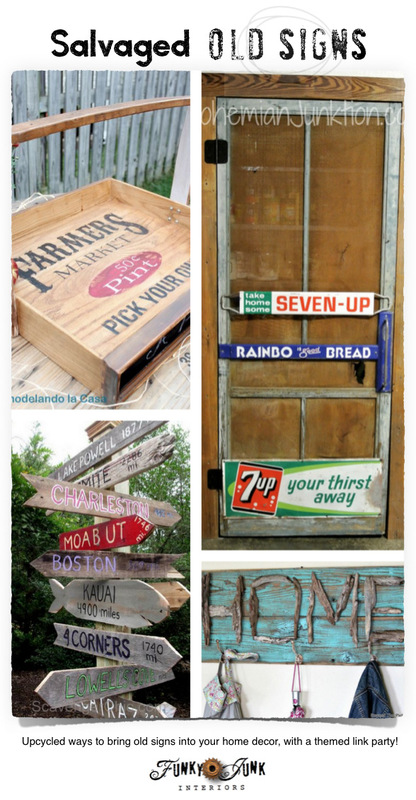 Isn’t this old screen grocery store door the coolest idea in the land?! I do believe I’ve finally figured out what I want my front screen door to look like… inspired! 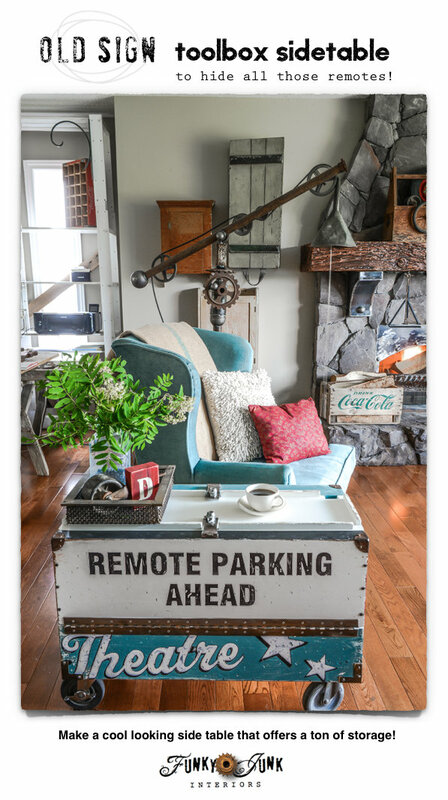 Desiring a place to hide all those annoying remote controls, this old vintage toolbox side table indeed did the trick… in true old sign style. I’ve done my fair share of old signs on most anything. 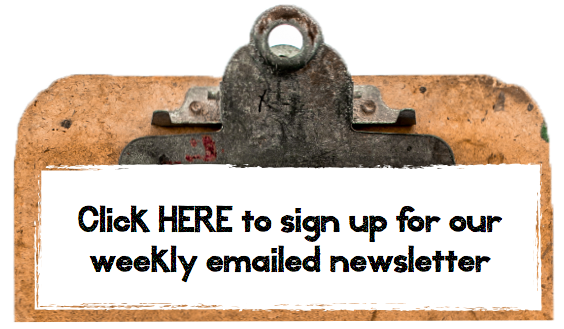 If you’d like to visit more of my own tutorials, click HERE. Wanna make your own old signs? Here’s my own post packed with inspiration on what to do and where, with links to like minded stencils to get the job done! 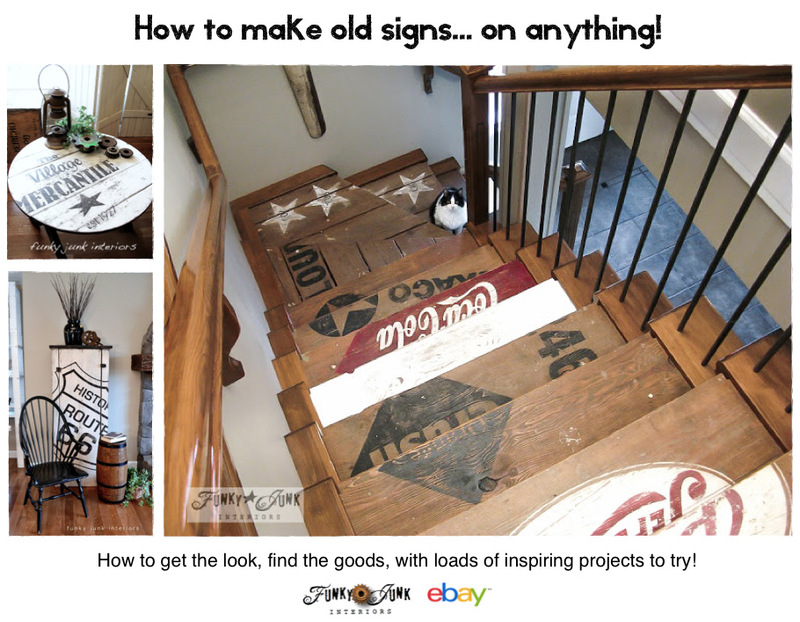 Do you have an old sign project to share? Link it up in this weekend’s 2nd themed linkup below! 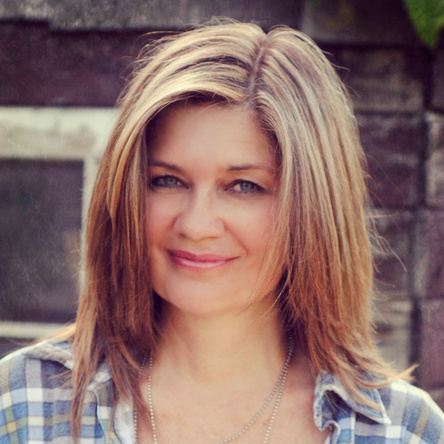 I’m so excited to have our screen door featured on your blog. I totally love your blog and your style. Thanks so much! That screen door is just amazing – looks like an authentic store I would have ran into as a little girl ! Thanks so much for the party Donna! What a wonderful party, and holy wow on those features. I’m particularly fond of the old direction post. I’m slightly in love. Thanks for hosting, and have a wonderful week. 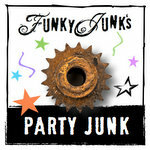 As a long time admirer of Funky Junk, I was thrilled when you chose my sign post to feature this week. 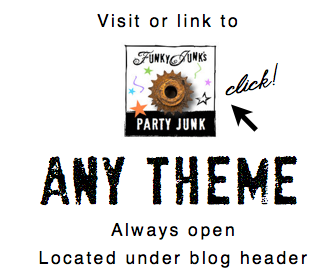 Love your link parties every week and your themed link parties always give me tons of ideas. I love the signs! Thank you for hosting the party. Have a great weekend! Old signs – any signs actually – are my weakness. I like them in all their forms – chipped rusted, bent and wobbly. I keep finding new places to display them so love the side table idea. Your blog is always my o to place for inspiration. Thank you! It sounds like you are having some awesome times. I love all the signs that you featured. Thanks for the party. Have a great time at the cabin. There is a wonderful selection of signs.